If you love rich foods as much as I do, you probably know how a cream sauce can really make a dish. 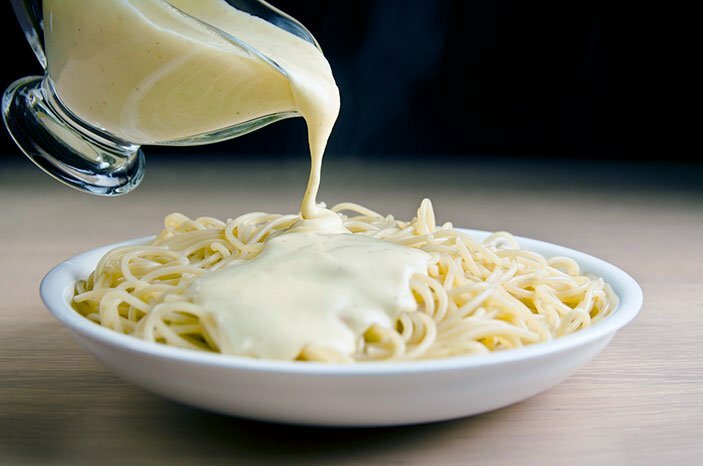 Unfortunately, plant-based eaters are often unsure of how to make a cream sauce without the dairy milk, cheese, and butter. The good news is that it’s easier than you think! Simple and versatile vegan cream sauces can be made from a variety of healthful bases, such as tofu, beans, nuts and plant milk such as unsweetened soy, almond, cashew or hemp milk, as you’ll soon see below. Just how is a cream sauce made, you ask? Well, a classic French-style white cream sauce, called a Bechamel sauce, is made by combining fats, such as butter or pan drippings, with a starch such as flour or cornstarch. 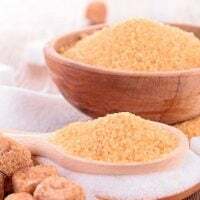 This mixture of a fat and starch is called a “roux.” Milk is then added to the roux, heated and whisked until thickened, a process known as a reduction. Cheese and other flavorings can be added depending on the recipe. Making a plant-based vegan cream sauce isn’t all that different. While a vegan sauce can be made with vegetable oils or highly-processed vegan “butter,” we’ll be leaving out these unhealthy fats and substituting fats from nuts or tofu for our whole food plant-based versions. Our flour-based version is made right the pan while those that use soaked nuts or beans require a high-powered blender such as a Blend-Tec or a Vitamix before heating. A plant-based vegan nut-based cream sauce often uses raw cashews which add a nice creaminess and a touch of good-for-you fats. Cashews are softer than almonds and take less soaking. 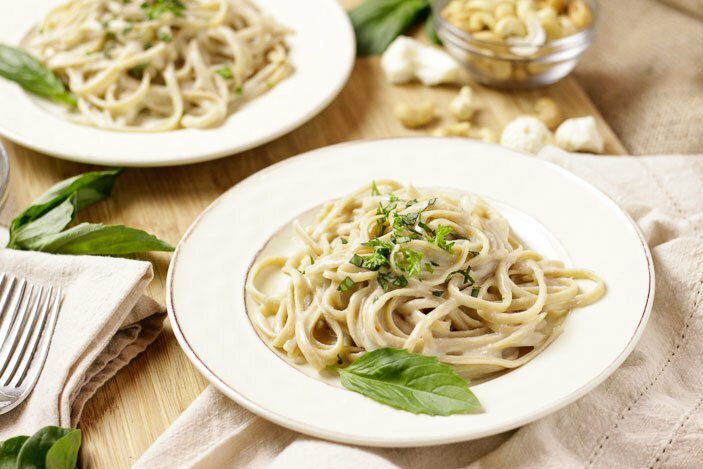 For example, try this easy cashew-based Alfredo Sauce which can be served over fettuccine or other pasta. This popular Bitchin’ Sauce, on the other hand, is made with almonds. It’s a great dressing and or and can also be heated and served over vegetables or baked potatoes. For a completely oil-free sauce, you can make one using cannellini (great northern) beans because of their creaminess, mild flavor and light color. Or alternatively, you can just use a starch to thicken your sauce. 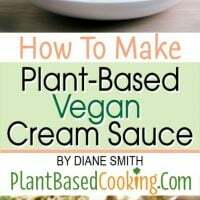 Keep reading to discover how to make your very own easy plant-based vegan cream sauce from scratch in very little time. A cream sauce can be used as a base for other recipes or served with pasta, over vegetables or added to soup or lasagna to add creaminess. Once you’ve learned how to make a plant-based cream sauce it opens the door to all kinds of variations. Use your creativity to transform these simple sauces by adding other ingredients such as red peppers, spinach, tahini, lemon, avocados or cauliflower. This version uses raw cashews. Add to a saucepan over medium heat and whisk slowly until heated through about 3 minutes. 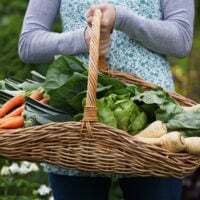 Adjust consistency with additional vegetable stock or water, if needed. Toss in your favorite cooked whole-grain pasta or vegetable noodles along with your choice of chopped fresh herbs such as dill or basil. This version has no nuts or beans. Place the flour and about 3 tablespoons milk in a container and whisk to remove lumps, or place in a closed jar and shake. Add the nondairy milk to a saucepan over medium heat. Add the flour slurry to the milk and whisk while heating through about 3 minutes. Adjust consistency with additional vegetable stock or water, if needed. Now that you know how to make a basic plant-based cream sauce, you can get creative with additions to change it up. Add avocado to make an avocado cream sauce, or try lemon, spinach, or red peppers, for instance. I hope you’ll try one of these healthy plant-based cream sauces in your meal plan today. Pasta never tasted so good. I love to hear from you. Please leave a comment below about the variations, successes or “learning experiences” that you’ve had with vegan cream sauces. Thank you for the recipes, I’m fairly new to being vegan, you made these recipes very simple to follow! Gonna try today! Hey Rhea, Thanks for the feedback and I hope the recipe works for you! Adding extra flavorings, herbs and spices help “spice” up the flavor depending on what you’re making it for. My kids (who aren’t vegan) even loved my Creamed Spinach recipe I made with soy milk this Thanksgiving! How far ahead of serving can these sauces be made? Hi Sharon, You can definitely make these a day ahead. They might thicken up as they cool so heat them slowly so as not to burn. They should last up to 3 days, at least. I hope that helps. Hi, I am so excited to try your sauces. 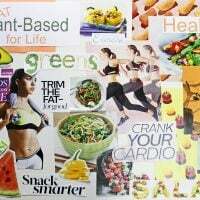 I am determined to change my eating habits after reading Dr. Joel Furhman’s book, Eat to Live. It makes a lot of sense to me. As an aging female, I would like to go in to my retirement years in good health and keep that good health. Yay, my husband is very open minded so he is willing to try new things. Thank you and I’ll report back to you.